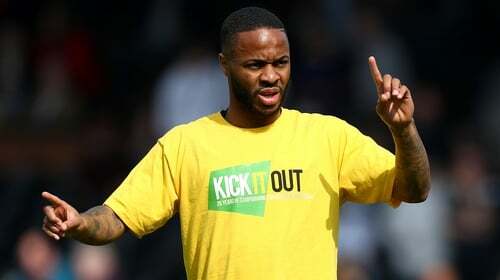 Raheem Sterling said "I'm black and I'm proud" as he rejected calls for players who receive racial abuse to walk off the pitch. The Manchester City forward was speaking after a weekend of football that was marred by shameful events in England and Scotland, just days after Tottenham's Danny Rose said he was looking forward to retiring from a game which has done too little to tackle the problem. "I wouldn't personally agree with it," he said. "To win the game would hurt them even more, they're only trying to get you down. "If you walk off they win, to score or win would be better." Sterling has consistently raised the issue having received abuse himself, but said he could not understand what drove people to be racially abusive. "It's offensive but my mum always told me I'm a wonderful black child and I know this," he said. "I'm black and I'm proud, and I'm confident in my body. Some people can't take it but my mum always told me to love myself and who I am." Sterling was speaking ahead of City's Champions League clash with Tottenham, whose left-back Rose said last week he "can't wait to see the back of the game" because of inaction on the problem. "I think it's a very delicate situation, it's not easy," he said. "It's a very personal situation, how you feel, your emotion and how you can manage your emotion. "We are here trying to help everyone. It's a thing we are of course fighting all together to try to stop. "We need to stop it not only in football, but in all different areas and situations. "Danny and Sterling, we are very sorry for them, but they have the capacity, they are famous people, they have the (platform to speak out). "How many people outside cannot say anything, but only go home and cry? That is a thing that I hate and I will do everything in my power to try to stop." "The man has since been released under investigation pending a charging decision by the Crown Prosecution Service (CPS)," a police statement said. There was also an arrest after Derby's 3-3 draw at Brentford, where Rams midfielder Duane Holmes was the victim of alleged abuse. Speaking at a press conference on Monday, Derby manager Frank Lampard said: "(Duane's) OK. He was upset at the time, which is understandable, but now he's OK. It's up to the authorities to deal with it now. "This is not just a problem for football. It's everywhere." On Monday, a 38-year-old man was charged with using racist language at the Edinburgh derby. Police Scotland are also investigating after footage was posted on Twitter which purported to show racist abuse directed at Hibernian midfielder Marvin Bartley during his side's 2-1 win over Hearts. A police spokeswoman said: "Police in Edinburgh are investigating following a report of a hate crime at Tynecastle Stadium. "The incident happened on Saturday, April 6, and was reported to police on Monday, April 8." Hearts said in a statement: "The club abhors racism of any kind and will take appropriate action against any individual found guilty of racist behaviour within Tynecastle." The Scottish Professional Football League said racism was "completely unacceptable" and it supported any steps taken by its clubs to identify the perpetrators. A spokesperson added: "Once identified, it's vital that, as well as prompting club bans, such behaviour is dealt with severely by the courts. "The SPFL wholeheartedly condemns all racism and, whilst rare in Scottish football, it's something we and our clubs take very seriously. We would strongly encourage supporters who witness any kind of discriminatory abuse to report it to the police."